Iowa native Anna Humphrey is a second year student in the graphic design and interactive media program with a concentration in communication design. Humphrey also minors in Spanish and art history. Ever since I can remember, I’ve been interested in art and loved drawing and painting. When I was younger, my grandmother always created these really beautiful watercolor paintings that I loved. They were all over our house and one hung over my bed, so I would always look at it as I was falling asleep. It was amazing to me that someone could create something so interesting and unique with so little material. When I got older one of my aunts took me to her design firm where I got more involved with the design world and since then that’s what I’ve been doing. 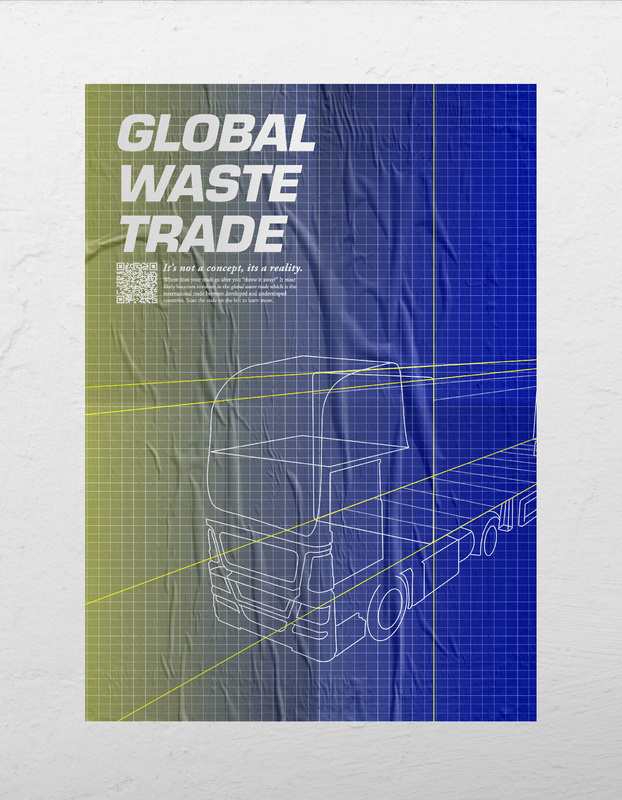 I love how art and design can communicate complex ideas and emotions to a global, diverse audience and the challenges and problem solving it takes to take a concept and turn it into something aesthetic and tangible. It is definitely a complex process that takes a lot of passion and a lot of sleepless nights. However, I could never really imagine studying anything other design. What styles or mediums do you prefer? As far as design goes, I always gravitate more towards an illustrative style. I think illustration adds character to designs and makes them unique. It gives the work a voice that only that specific designer can produce. I’ve always thought it’s interesting how you can create the same object or the same scene in multiple different design styles and each one will still have a completely different connotation and feeling to it. Apart from digital work, one of my favorite mediums to work with is paint. I used to go to art museums all the time with my family and spend hours getting lost in all the paintings there. Its fascinating to me how you can create practically a completely different world that’s completely 2 dimensional. Working with paint always proves to be an interesting experience because there are endless amounts of ways you can manipulate the material and the application. Painting definitely gives a tactile feeling that can sometimes get lost with digital work. Do you take influence from any artists or designers in particular? One designer I have always loved is Morag Myerscough. She has designed a lot of interior and exterior signage for buildings and recently designed a permanent exhibition for the Design Museum in London. In all her work she uses bold, bright colors and really unique graphic styles that I admire. She often says that the best part of her designs are the fact that they bring something beautiful and unique to a previously boring environment which is one of the reasons I like her. Her work shows how design can be used to enhance and completely reinvent a space and make people feel like they belong there. Are there any projects that stood out during your career at Stout? In my graphic design I we were asked to design a series of 6 novelty stamps. There’s definitely a challenge that comes with creating designs for a series, but those challenges are part of what makes design interesting. 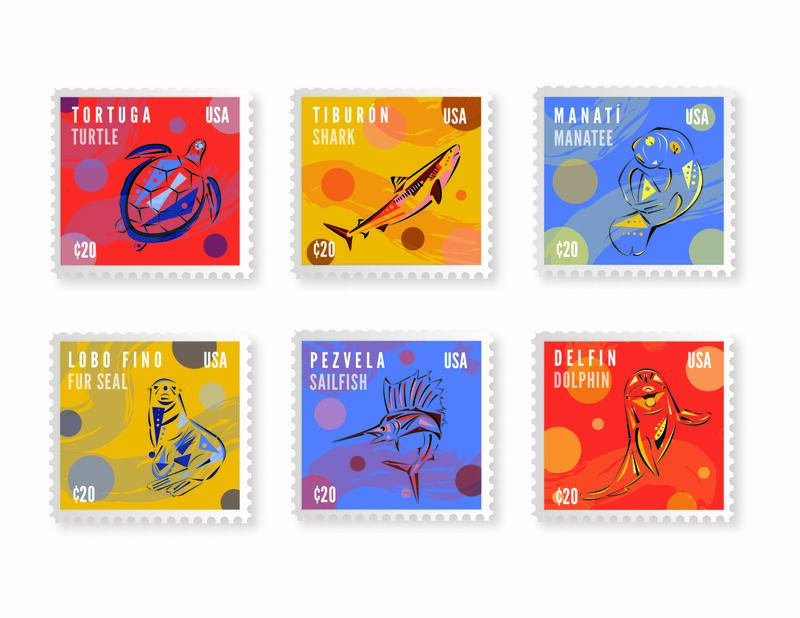 For my theme I chose to do illustrations of Latin American sea creatures with the animal names in both Spanish and English displayed on the stamp. For the style I took inspiration from the colorful, geometric art of the indigenous people of Peru. During this project I really got a chance to explore other design styles and subjects, which was a really great experience. The world around us is rapidly growing and progressing which is why it’s so important to celebrate diversity in every aspect.This is one of the reasons why I often like to incorporate multiple languages, styles, and iconography into my work. One of the things that always fascinated me about graphic design is how good design can expand across cultural and language barriers and communicate complex concepts to so many different people. Another project that I found really interesting was for my Typography II class we had to create a book cover without using the title of the book. We also had to incorporate a 3D medium into our designs. I created a cover for Treasure Island by Robert Louis Stevenson, and it was definitely an interesting process adding a 3D aspect to digital design. 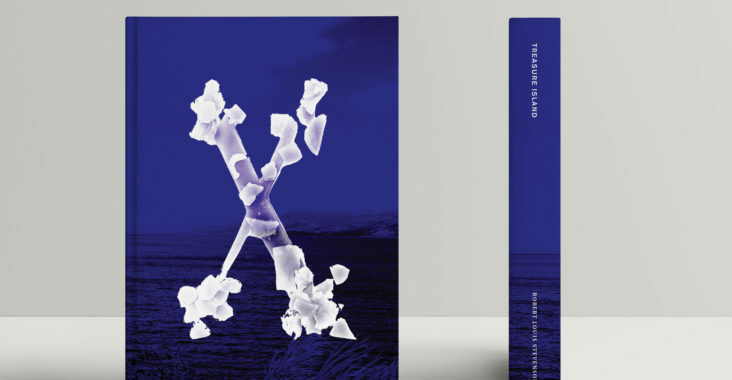 I ended up creating an X out of wax from a wax melter and scanning it into photoshop to make the artwork on the cover. This project opened a whole new style and application of design for me. Have you done any internships or projects outside of academia? 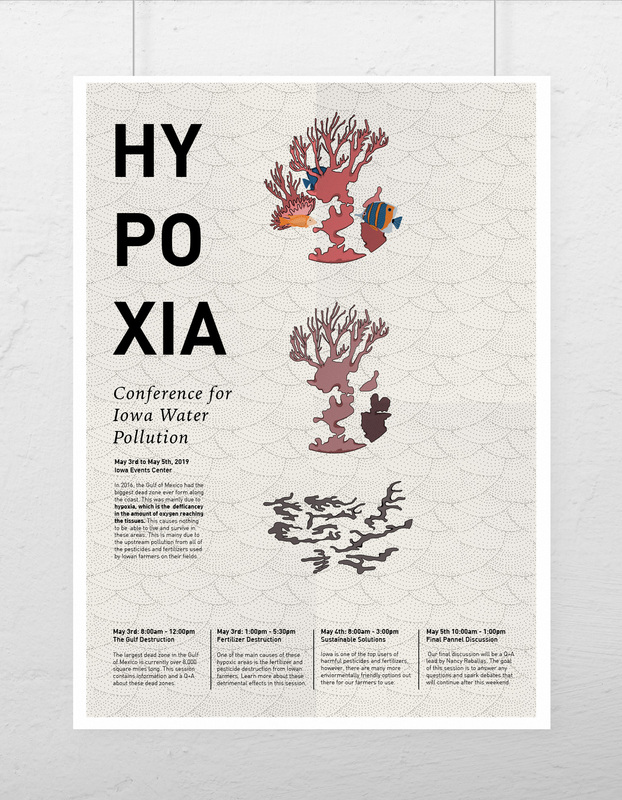 I recently began working as part of the design team for the UW Stout honors college, where I have been making event posters and designing the freshman orientation material for incoming students. Outside of work and classes, I’m also an executive member for Pepper Magazine on campus and worked this summer with the other board members on a rebranding campaign for the publication. Aside from that I have also created design content for 4 Pepper issues and most recently I designed the cover for the 19th issue that is coming out this semester.